My name is Tiffany Kormendi. I am a graduate student in the BA/MAT program in history and social studies education. Before I entered college, I thought, “Hey, I’ll study hard, have some fun and graduate in five years with my two degrees.” However, by Spring 2017, my college experience became one any student would have just wanted to end. 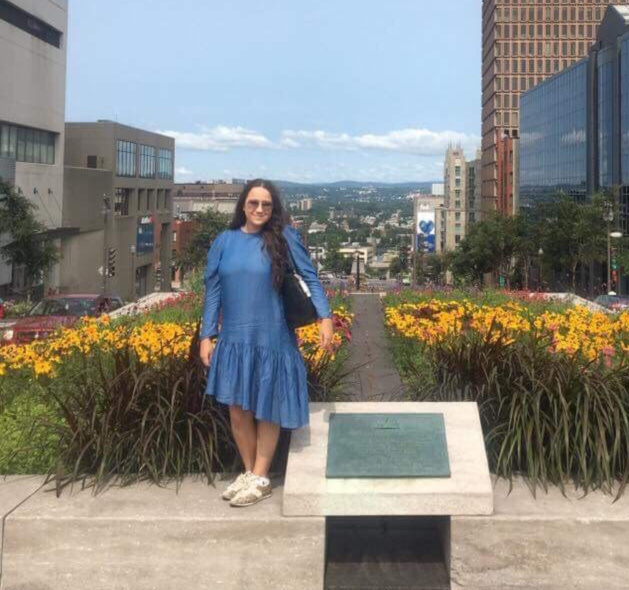 In Spring 2017, I took CEG 524, a seminar on late-modern Europe, with Professor Young-Sun Hong, who is married to my program director, Dr. Lawrence Frohman. 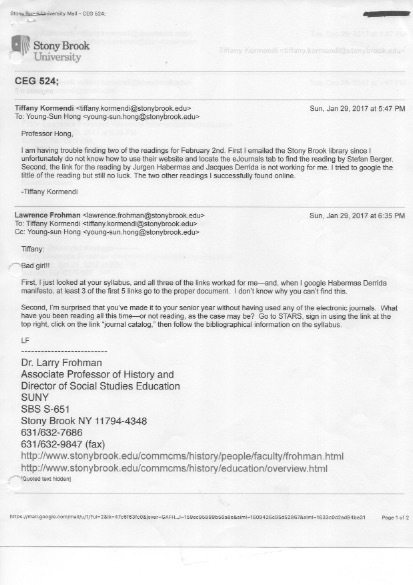 I emailed Professor Hong a question regarding locating a reading assignment on Stony Brook’s online library… A student would expect their professor to answer the email; however, in my experience, Hong and Frohman shared their emails regarding students with each other, blurring the lines between professional and personal. I knew right then Frohman would try to stir up trouble with me, since he has repeatedly done so in the past, while numerous students and the university for years have condoned this and other kinds of behaviors. I began to experience issues with Frohman as the semester wore on. As the Spring 2017 semester progressed, I became increasingly alarmed that Frohman, the program director, was telling me information that differed from that of the Director of Field Experience and Student Teaching, Charles Backfish and the Assistant to the Department Chair of History, Susan Grumet. In a series of emails, I was able to track how my program director’s distorted reality that I was off-track to student teach in Fall 2017 based on his claim that I was not receiving “at least the minimum grades” was inaccurate. Since Spring 2017 I have continued to have numerous problems with professors in the history program. I strongly believe in my gut that Frohman has influenced past professors of mine, and a recent event in Spring 2018 solidified that original feeling. Professor Brooke Larson of CEG 535, admitted it in writing. On numerous occasions, I have tried to bring my continually multiplying problems to an array of personnel and offices, such as Dean Ken Lindblom and Provost Michael Bernstein. Yet none of these personnel and offices have helped me thus far. Instead, most of them have “encouraged” me to consider another career. During my meeting with Lindblom on Jan. 29, 2018, I brought to his attention numerous problems, in particular, the “bad girl” comment. When I showed Lindblom the email he responded “I think he’s kidding. You don’t think he’s kidding?” When I had a meeting with Bernstein on June 11 with my parents to discuss the issues I was facing, I brought up how a classmate of mine allegedly had an impending lawsuit against the university and as a result, Frohman was not allowed on campus as of April/May of 2018, yet still had contact with a professor of mine and guided her to give me a failing grade. 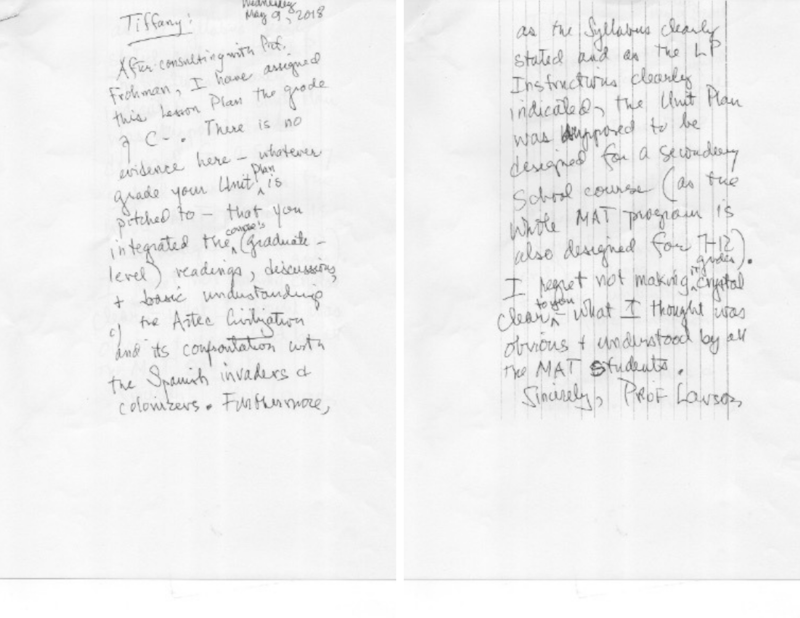 Bernstein directed the conversation to whether or not I submitted a grade appeal regarding my claims that Frohman was influencing professors in the history department, while ignoring and failing to comment on the “bad girl” comment. I explained to him that my past experience with the grade appeal process has been negative, as the committee claimed to do a thorough review yet admitted it did not look at all the claims I made. I remarked to Berstein that it is suspicious that someone can claim they did a thorough review, and instead select and choose what to look at. Bernstein argued that it is consistent with the university’s policies. In my opinion, Bernstein tried to separate the matters instead of realizing that I am arguing that there is a clear connection. He said “In your opinion that may be the case,” but tangible evidence is hardly a student’s opinion. Bernstein explained to my parents and myself that if a professor tells a student they should leave their program, “an instructor is entitled to do that and I may not agree with it and may do something else.” Bernstein also said that he would follow up with me and he has not for the second time. I originally reached out to him by email on Feb. 2. The only response I received was that the appropriate leadership would reach out to me, and I can document proving that no one reached out. In our June 11 meeting, I was again told, now verbally, by Bernstein that he would follow up with me. Bernstein then backtracked and claimed “A professor renders judgment and can document why they are rendering that judgment; then that is their judgment and they are the instructors in charge and not we,” referring to himself and the vice provost sitting next to him. I then attempted to reiterate what Bernstein said “to document” and I reminded him how Professor Larson did not include a single comment on my final assignment other than the note I received. Ultimately, another meeting ended with no clear resolution; rather, only with a confirmation that the university does not help students to navigate and solve these types of situations. Some students in my program or even in the undergraduate program have faced worse from Frohman. Some have faced less. Nonetheless, there is a shared commonality in our story. A man, who is supposed to have guided, taught and inspired students to become the next generation of teachers, instead hurts, scares, bullies, harasses and stalks students. I can only speak for myself, but I certainly do not feel safe or comfortable being in my program anymore. Every time I walk into the Social & Behavioral Sciences Building where all my courses and the history department are located, I live in fear that will be the day a professor from my past confronts me for speaking out. If and when I do graduate, I sincerely wonder how I can enjoy that day, the day that so many students look forward to being done with their college career, knowing all the horrible experiences I had that easily could have been resolved if someone would have listened and helped me. I highly doubt this is an isolated problem within the social studies teaching/history program. Because the university makes the process of reporting problems unnecessarily difficult by sending students to numerous offices repeatedly, there could be a possibility of other problems not being reported. If a student gets the “opportunity” to talk about their issues, I feel there will be minimal to no effort to solve the problem. The university needs to reevaluate its policies and procedures and the values it claims to uphold when handling cases of alleged professor misconduct. The Statesman reached out to Provost Bernstein and Dean Lindblom multiple times for comment. Lindblom declined to reveal details of his discussion with Kormendi on ethical grounds, but confirmed it occurred and said he referred her to the Title IX Office.